Sturt made a point – in more ways than one – in the 2017 SANFL Grand Final, as PETER SWEENEY reports. If you don’t barrack for Port Adelaide, you barrack for whoever is playing them. So it was on Sunday in the title decider in the SANFL, when the Magpies were favoured to wrest the championship from current holder, Sturt. Officials were banking on 30,000 going to the Adelaide Oval. The crowd was just 187 people shy of 40,000. Musician Daryl Braithwaite was a hit with all pre-game – until he said he believed the Crows, who less than 48 hours earlier had flogged Geelong at the same spot in front of 53 plus thousand – would win the AFL flag. “Boo,” came the catcall from Port supporters. When Braithwaite said he was going to go ‘Riding on the Horses’, peace returned. Until a helicopter hovered above the ground. When it landed, Port and Sturt legends John Cahill and Damian Squire alighted, carrying the premiership cup to the middle of the ground. Sturt broke through a banner reading ‘We are one club, but we are Two Blues,’ while Port followed through the words ‘We exist to win premierships’. The name of the woman singing the National Anthem wasn’t listed in the Budget. And she wasn’t given the mail on when to start knocking out the tune. More likely the two teams, and even the men in white, green or whatever colours umps don these days, weren’t given the mail when to – or were slow to – line up. Half of the song was over by the time they had lined up. But Sturt weren’t slow out of the starting blocks – and were on target to follow the lead of their reserves side, who had won the flag. Come quarter time – on a sun-filled oval but in chilly and windy conditions – the Two Blues had four on the board, two more than the Magpies. There wasn’t much action in the following two terms, Sturt kicking two goals, the Magpies only one. Port, flagless in the SANFL this century following seven premierships in the 1990s, have just 3.7 on the board when the teams turn for home. Three minutes into the last stanza they are three goals astern. They sense they must do something. They do. They run, find space – and, more importantly, find the big opening, three times. At the 13 minute mark, it’s all square at 6.7 and even the heartiest of Sturt supporters has that feeling they are about to be run over. Not so. Five minutes later, the Two Blues get a straight kick in front again. They add a minor score soon after – which proves to be the winner. At the 24 minute mark, the drama returns, after Port’s Brendon Ah Chee wins a free, appears to hurt his knee but gets up and kicks a telling goal from the 50m mark. The ball is in Sturt’s forward line when the siren sounds. Their followers – and many from the other clubs in South Australia such is the feeling towards Port having some AFL players available for selection in the state competition – are jubilant. A grand final win. Over Port. And by a point. Life don’t get much better than that. Surprise, surprise, Port supporters don’t stick around. 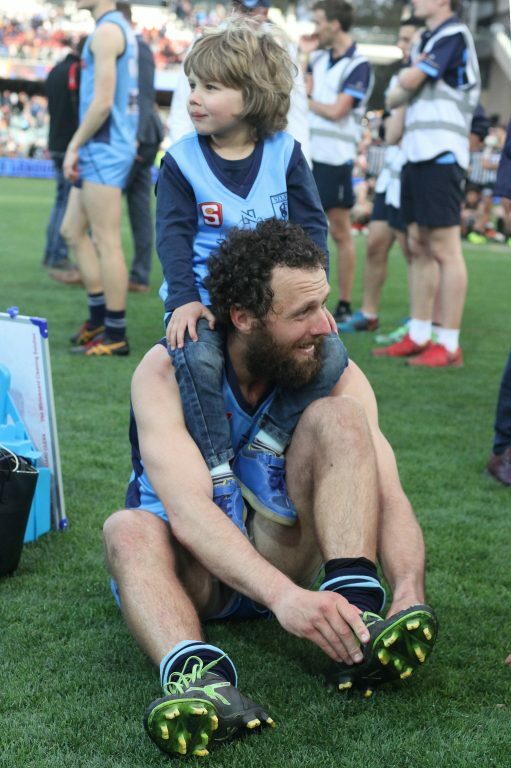 Sturt premiership player and ex-Kangaroo Scott McMahon and son Noah. Photo by Peter Argent. 41 years later, they triumph again: History doesn’t repeat itself, but the rhythm does. Q> What’s better than beating Port by 100 points? A> Beating them by one. Port, in whatever guise clearly don’t have the ticker to win close games. Congratulations Sturt. Any win is a good win or so we are told but gee a one point is nail biting. Another good write up mate and although I didn`t see it all have to agree. Must admit I had a nanna nap half way! I have just one question, why can`t my beloved Eagles win final games, please just for me win one! Thanks for your coverage of the SANFL finals series, Peter, I have really enjoyed it. And I REALLY enjoyed that footy game yesterday. Tough, tight, hard – 261 tackles were laid. Structurally, Port had the advantage for two quarters but Sturt just kept dragging them into the contest. Kory Beard’s last 10 minutes were just inspirational and turned out to be the difference between the two teams in the end. Congrats to all Sturt folk! Thanks for this Peter, much appreciated from my Para Hills East East vantage point. It took the eventual premiers to see off Centrals. I claim this as a moral runners-up. Good to see the big crowd. How many were Port followers? Thanks Peter. The last quarter was compelling from our spot in the very top row of the Sir Edwin Smith. Can’t believe my bet that Daryl Braithwaite would finish with a crowd-participation version of “Horses” only returned $1.02. Enjoyed that nearly as much as the Jumbo-Prince inspired triumph of 1976. Go the mighty double blues! Magnificent to beat a team with several AFL listed players. Great atmosphere with 39,000 plus in the house. Lot of Sturt support at the ground. My guess is there were about 15,000 in double blue colours and another 5,000 neutrals supporting Sturt. Might have been 1 point and ordinarily, it would be anyone’s game…..but strangely though, Sturt looked in total control for the last five minutes and really didn’t look like losing. Thanks also to Daryl Braithwaite. Great way to start the game. Confusion at the start when the young lady started singing the anthem and the players were finishing their warm up. Seems someone failed at their one job and they won’t be getting that gig again. BD et al, is there a video of the match somewhere? I followed on the SANFL website with updates etc. Did Tom Harms have B. Ah Chee in the last quarter? I see from the highlights he was in a one on one that resulted in a free kick and goal to BAC. Good use of the body I would have thought! At 10 min mark of the first quarter I thought Sturt are a good chance to win. Not just because they were hard at it and were a goal up but a few Port players were doing the flashy but ineffective stuff like stylish kicks that just miss their target. Port soon knuckled down but not before Sturt took a 15 point lead just before quarter time. Agree with Paul regarding Sturt looking in control furing the last 5 min. That has been their specialty when a holding a slender lead. I don’t recall a game where there were half as many tackles as kicks, and it was a dry day, just a bit breezy. These two teams were the highest scoring in the comp but defence on the day was superb. Port were switched on enough to cover Sturt’s switch. Sturt were patient and disciplined enough to go down the line, virtually all game. JTH, Tom Harms snapped a match winner in the 1st quarter. He was one of two defenders to slip forward and kick a goal for Sturt, catching Port off-guard. That free he gave away in the last would’ve been called play on by most umps but from my view only 20 metres away I saw why an ump would pay a free. I’m guessing the ump actioned tunnelling . T Harms look in a good position to spoil. I don’t think Ah Chee was his man. Ah Chee was one of their onballers who in the last quarter made Sturt look tired.The replay should be on Plus7 today or tomorrow. It may appear on youtube before then, a bloke called Ninja has been uploading the finals for us. FWIW I thought the Ah Chee free was there. In hindsight it set up the perfect result. Fair report. FWIW reckon D. Braithwaite was just in front of Meat Loaf as a GF performer. Re your last para, 2 words – Kirkwood & Beard. The mighty DBlues win was one for the ages. Mattner clearly outcoached Cornes and his 16 AFL listed “stars”. All day the Sturt rucks dropped the ball in middle of the pack to keep the game in close and away from the Port runners. Last quarter is compelling viewing – tough & hard. Nothing better than local footy – a Crows win Saturday will be a bonus. Love that photo of Loose McMahon. Miss him at North, glad he’s done well since moving on.